I absolutely love your site. I am a novice herpetologist enthusiast at best and while I would love to know what snakes I run across, the ones in Thailand seem incredibly dangerous and unpredictable. Any chance you are a lizard enthusiast as well? I like your site, very interesting. We have some snakes living in and around our garden. When I say some, I mean one very, very big python, which I made a short video of and it looks like it has a dog or something similar inside it, making its slow way into the undergrowth outside. We have found a clutch of about 40, hand sized eggs that the neighbor sent to the local vet. 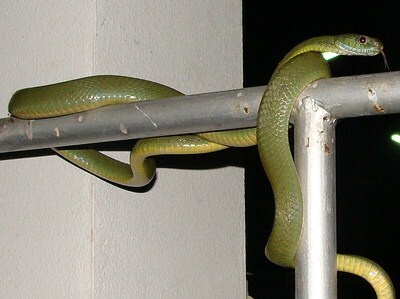 We have in the last few weeks seen a fairly big, 1 metre, green diamond backed snake that our dog saw off. That was in our garden, it’s now under some wood in the garden and me, my wife, the maid and the kids are a bit scared to go near it as it was fast. We had a constrictor outside our kitchen, behind a rubbish bin that was eating a frog and looked a bit like the 1 metre snake with the diamond back, but was much smaller. The one eating the frog was only about 1 foot long. Not long ago a python was climbing our tree outside, it was about 4, 5 feet and not very thick, about twice a thumb thickness. I fight with my wife all the time as she tries to kill them and I have to stop her, although I must say, I am getting a bit tired of how frequently they appear. Keep up the good site, it must take a lot of your time keeping it updated, but worth it. 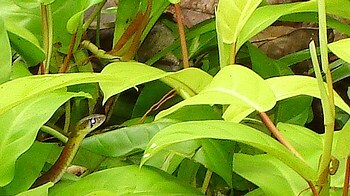 We get frequent visits to our Edge of Junglr Garden by various reptiles – mainky snakes, lizards etc. Currently we have observed Red Back Snakes of various sizes. The Maid wants to kill them but I believe they are hunting the frogs/toads we have in our back garden. Trouble is when we do see a snake we do not have time to run into the house to find our Snake ID Book to see if dangerous or not. Only worried if my kids are confronted by one. Otherwise live and let live. Like your site. Well Done. Tony R.
I like your site very interesting and well explained! Many Specimens that I had never seen before visiting your site. 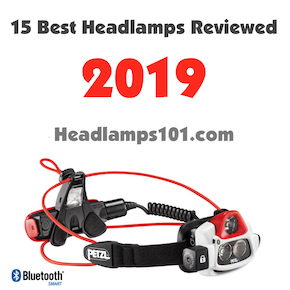 Continue to send us your videos who are very informative. 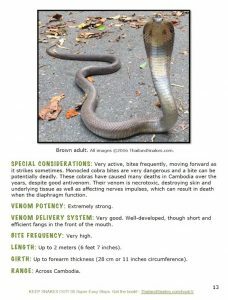 I just had a 3 meter Python in the Garden, i stay in the Coconut land on Koh Samui, i love snake, thanks for your site…..i can finally put names to some of the creatures i see. 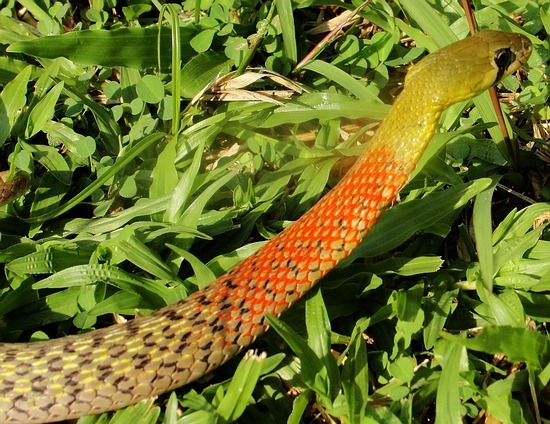 hi, thank you for the site living in phuket my thai wife,child and now i have been seeing what we now believe(thanks to your site) to be a golden tree snake in our yard . same behavior you describe very fast an ground then goes up a tree in our yard we have planted many papaya trees and he can hide in them easily. what are the chances oh a Malayan Pit Viper finding its way into our yard and hiding under dead papaya leaves? we live in a quieter part of phuket near many rubber plantations. we all have a live and let live attitude like many thais , just would like to keep the deadly snakes away if possible. 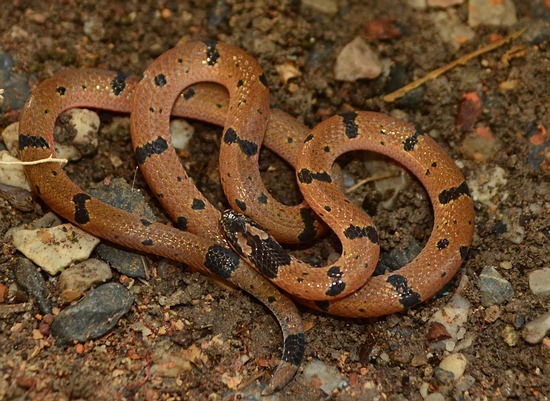 I think Malayan Pit Vipers can be found just about anywhere on ground. I’ve found them under leaves too. Recently there was one in my driveway in a subdivision – surrounded by a brick wall. How it got in – no idea. It’s always good to be cautious if you have kids around. I live in Phuket and had my first snake encounter this morning. It was long and thin just over a metre and was gliding across my roof. It was a pale green colour with a nice pattern along the body and at the head. I took a photo and went for help but when I returned it had gone. Thanks for an extremely informative site. Im currently on vacation in Thailand (right now in Hua Hin) and, although I have no knowledge about snakes, I have always been fascinated by them and, above all, by their beauty. 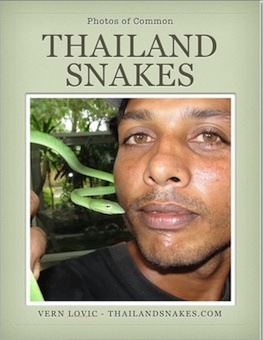 One of the Thai guys who I have been do some horseriding tours here seems very concerned by my interest in snakes – the Thais seem fearful and very superstitious of this creature. Den informed me that if you kill a King Cobra, you better make sure that you kill his wife, too (or vice versa) as he/she will come after you. He honestly bleive this …. I didn’t even know that snakes lived in couples ! 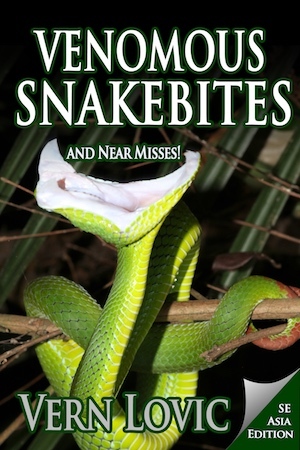 Anyway, love your site and has certainly kindled my interest in snakes even more ! Hi Kay, Thanks for your comment. Hua Hin has a lot of snakes – outside of Bangkok, this is where I get the most requests to identify snakes people see in Thailand. Ha! Thais have some great superstitious beliefs… the killing of the king and the husband or wife coming to get you is one of the best. Snakes don’t live in couples. No sense telling them otherwise though. Hi. 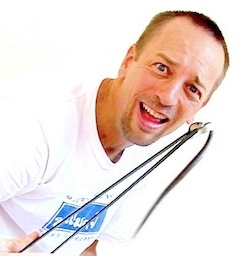 Im curently on obsurvation in bandon hoapital in koh samui as a snake bot me….after 5 hours…still no symptoms…just the place where i got bitten on the anckel. Safly i didnt see what bit me, but it was on mainai beach on the north pf koh samui. 5 minutes before that we saw a green snakemclimb a palm tree on the beach and the. I got bitten by the snake i diidnt see 5 minutes later about 5 or 10 meters aeay on the grund. I have all ready killed 3 cobra snakes in the last last 2 months here in the Phichit area, one of them was a baby so I know there will be about 30 or so more in the area. Dogs have found them each time. New to the site. Can you help with identifying a snake. It could be a tree snake but the colourings are not the same as the above picture. Hooped green and black body on top (maybe plain pale green underneath). It was quite small (maybe one foot long if stretched out), very thin (like a pencil in the middle and needle thin at the end). Wrapped itself around a table leg naturally. I live in an estate in Phathum Thani – so a “townie” really. 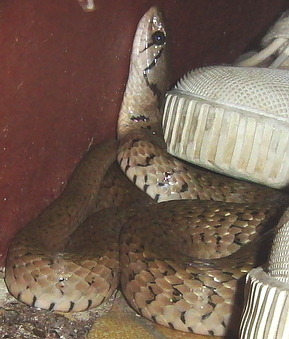 Came across a large, about four feet long, brown snake, curled up under some garden sacking on the patio. As I approached it ‘wriggled’ out and blew itself up to around twice the thickness! Then hid itself behind some loose brickwork. I got the gardener to remove it. He told me it was harmless, – a rat snake? Good question… maybe. How thick? Any pattern at all? When it doubled in size, was a pattern revealed? Vern, I just found your site and appreciate the useful information very much. We are building a house with a decent sized garden and pond in the Pranburi / Sam Roi Yod area south of Hua Hin. Recently we came across in our car a dark gray or black snake crossing the country road from one pineapple field to another. Grassy area, lightly wooded, but nearby hills are heavily wooded. I caught just a quick glimpse of it and was worried I had run over it despite swerving to miss it. 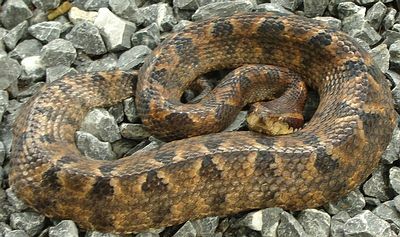 The snake looked to be about 2 meters long and perhaps 5-6 cm across at the midsection. I think I saw slightly lighter gray patterning on the back, but can’t be sure. When I stopped, turned around and returned to look for it it was not on the roadway. Either I missed it or it was a very tough snake. If you ran it over – it will likely die. They can still sometimes move for a bit, but internal bleeding probably gets most of them after being run over by a vehicle. Sounds like a rat snake – you have Ptyas mucosa and Ptyas korros up there, both of which could possibly fit the description. 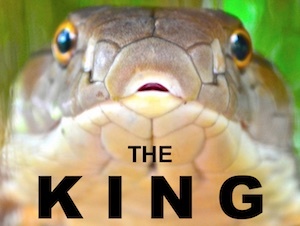 For the most part, your king cobras are yellowish. Cheers! I was out on the bike, so slowed for a look and kept going … I’ve run into all sorts of cobras, kraits and such out on my rides, plus I used to live in Australia ( say no more!) so, I’m used giving any snake a wide berth..
Any ideas as to what it might have been? Cheers! Hi Vern. I saw a 200 mm by 8 mm black snack with yellow stripes over its head about 6 weeks ago about three quarters of an hour north of Pattaya and wonder about its identity. I’d guess you saw a Golden Tree Snake. Did you see it during the day or night? In a tree? On the ground? It was during the day and I would say that you are right, a golden tree snake, and being so young didn’t look quite the same, the pattern not so developed. Can I say the pattern was more like a zebra than a leopard. Oops. You said 200mm. Not 2,000 like I was thinking. It could have been that snake. It couldn’t have been a king cobra, there’s no way they’re hatching up there, they haven’t even mated yet. Are you sure the bands were over the head? 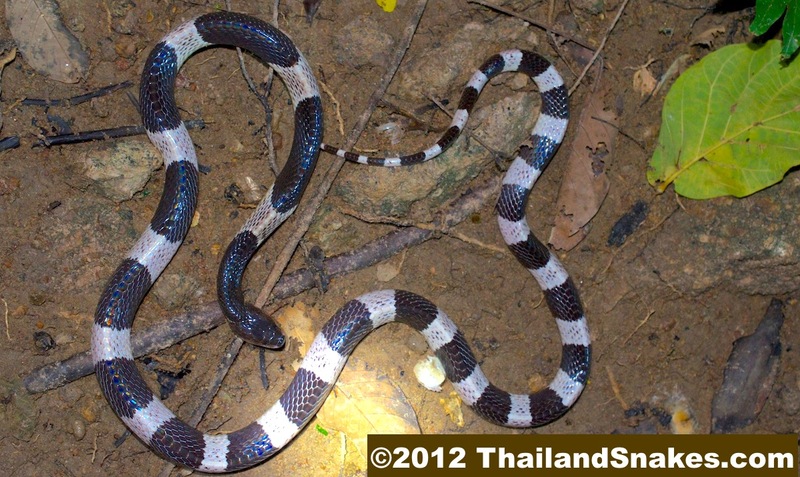 I wonder if it could have been a banded krait? I don’t think the bands ever go over the head though. Tough call. send it by email. Click Snake ID link at top right of website. Just met a guy who was bit on Pattaya Beach at night walking on the side walk next to the beach, Beach Road. There are many rats on the beach, so the snakes are probably in the palm tress. He didnt see the snake. It was a poisonous bite and his leg has blown up 3 times since antivenom at the hospital. What snake might it have been. Malayan Pit Viper most likely. It wouldn’t be up in a tree though. Was he leaning against a tree when the bite happened? I saw a 1.5 metre black snake. It seemed to have slightly paler rings towards the tail. Very fast mover. Also “ran” away from me faster than I did to it. Leapt 2 metres into space departing the back veranda. 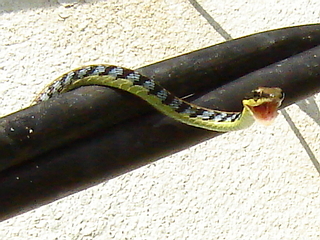 Typical venomous snake with smallish head compared to the main body. Tapered to a long thin tail. If I was in Australia, I would have called it dugite shaped and sized but blacker in colour. I am mildly worried because it seems to have moved in to my back garden. Many frogs, insects and geckoes in tall grass I am raising for my ducks. It seemed far different to rat snakes. Any ideas? 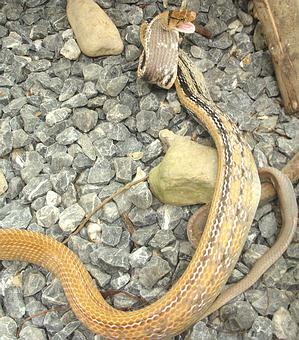 If the head was not huge – like a king cobra head, then there is a better probability it was a rat snake. There are a few of them, but I think you probably saw the Keeled Rat Snake. Ptyas carinata, they are pretty common and get big. Sounds like what you described. Just come across your website as I am from New Zealand where we have no snakes whatsoever. We are traveling to Thailand (first time in my life) for 8 x nights and I am absolutely terrified of coming up against snakes. Can I hire a snake bodyguard while I am in Thailand ? Please can I call you or something to discuss basic precautions for staying here? Hi Daniel, It’s very hard to even FIND a snake. You have very little to worry about. If someone stays in Thailand for an entire YEAR, even if they do the typical tourist things – like kayaking in the mangroves, or hiking on trails, I’ll bet that most people would not even SEE a snake during that year. They are not that common. Relax! my dogs just had some fun with this snake in the garden. Couldn’t really match it to anything in your website. Can you advise? I do a lot of wild freshwater fishing around Pattaya and also in Trat where I often come across snakes. I always wear leather sneakers and jeans but would like to know if they can bite through thick enough denim? 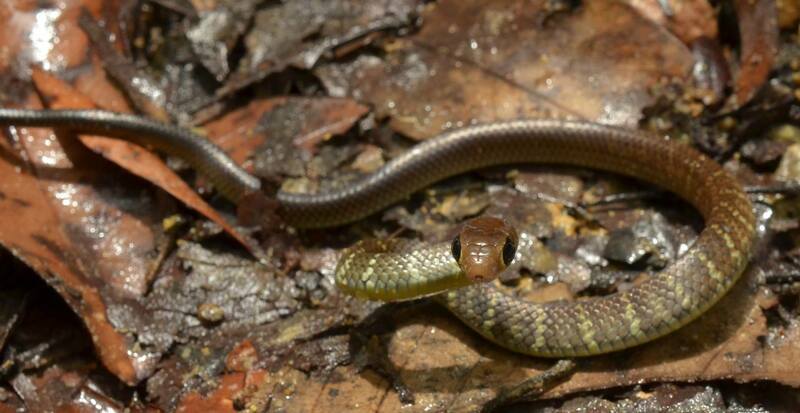 Do you wear any sort of special clothing when herping? I just posted on Thaivisa than found yr site. just found a 4ft snake in the house. Black and white chevron body, with orange head..
‘ Noo sar ‘ they said it was called ..bugger if I know if it was dangerous, but I nice looking snake..
On 3 Jun 2018 at approximately 2 PM, I was driving from Samoeng to Mai Rim (Chiang Mai area). As I made my turn toward Mai Rim, I spotted a 2 Meter Cobra near the white road line. I was able to swerve to avoid hitting it (barely), but it lifted the front of it’s body approximately 1/2 meter and opened up it’s hood. Thank god I was paying attention or it could have ended substantially worse. I attempted to turn around and get a picture but by the time I turned the motorbike around it had disappeared into the brush. My girlfriend, who is Thai, was thrilled at the sighting although I was just glad I wasn’t hugging the line as I usually do on that stretch of roadway. Sure thing – glad it helped! Do snakes have a home territory? About a month back there was a large snake on the spare land next to our building in Phuket. It was around for 3 days in the same place at the same times, afternoons. It wasn’t scared of people, didn’t move away. The Thai workers at the building all went to see the snake and take photos on their phones, they called it a cobra. It hasn’t been seen since, will it have moved away or is this its home area and its still here? Yes, a lot of snakes have a home territory – possibly all. They find a place they are comfortable and stay there as long as it’s safe, comfortable as far as temperature and humidity, and provides food. Cobras are known to stay around one spot – yes. Saw some beautiful snakes over my years in Thailand, including a Banded Krait in Lopburi, 20 minutes after my girlfriend telling me there were no snakes near the family home! Gotta love the Thais and their white lies. I felt privileged to see one though, didn’t even know what it was until I got home and googled it. Unmistakably a Krait. Wish it was me! I’ve seen a big one DOR, but not alive yet. I would prefer “kill them all” :D I saw one green snake (80cm long) climbing on 7th floor if condominium in Bangkok. I had to help it fly dosn :D Unfortunately snake landed without harting itself and ran away (BTW I gave it over 10 minutes to run away but I cannot risk Nd wait more). Now I am thinking what should I do to avoid unexpecte guest on my balcony.